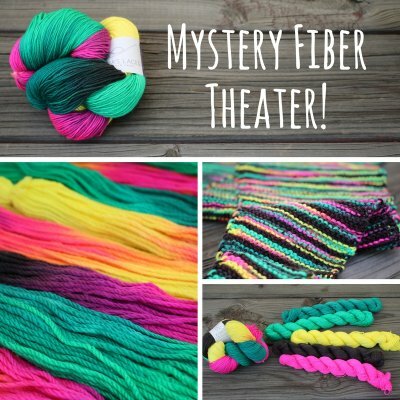 Lorna's Limited Edition - Mystery Fiber Theater! Textures of Nevada Shawl, Part III! Our robot-building skills may not be up to snuff, but we sure know how to whip up a cozy accessory or two! Check out some of the things we've been working on! 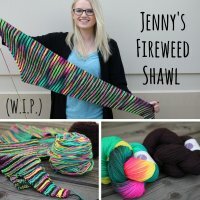 Jenny paired Mystery Fiber Theater in Shepherd Sock with Grand Street Ink (any sock yarn in black will do) to create an out-of-this-world Fireweed Shawl! We love how this color looks paired with a black solid to make the neon colors really pop! 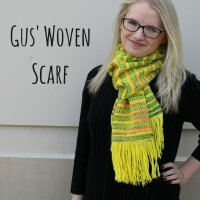 And Gus grabbed a hank each of Shepherd Worsted and Haymarket, coupling Mystery Fiber Theater with Sunny (a bold new neon yellow!) and got to work weaving up a scarf that is loud and bright and perfect for spring! 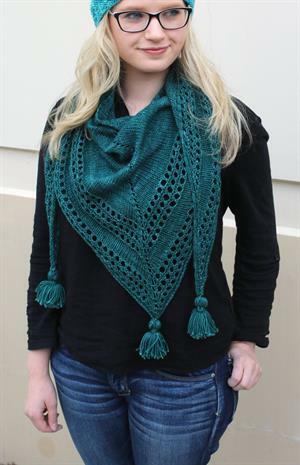 Can't get enough of Lorna's Limited Edition yarns? We can't either! That's why we've got two new Lorna's Laces subscriptions in the works! A Jimmy's Sock-of-the-Month Club and a Super Sock-of-the-Month Club! Both will ensure that your yarn is delivered to your door automatically each month! 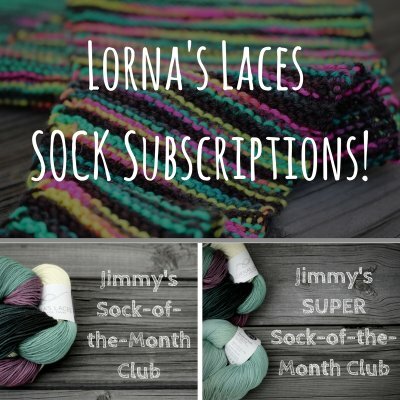 The Sock-of-the-Month Club will feature one skein of Lorna's Limited Edition Shepherd Sock, while the Super Sock-of-the-Month Club will feature two - one in the limited edition color along with a regular stock coordinating color. 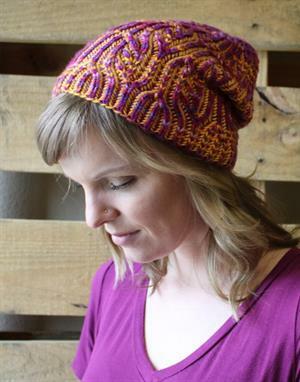 Here's the kicker: those who subscribe will have access to the yarn before anyone else! These skeins will be shipped to subscribers around the 25th of each month - a few days before the official release of the color (the first day of the next month).The first installment ships April 25th and will feature a VERY exclusive color* that will only be available to subscribers and our retail customers, so subscribe soon (before the 20th for the first installment) or make plans to come visit - we'd love to see you! *After the May exclusive, this subscription service will resume with June's limited edition color. Our 3-month Big Beanie Bag project from designer Jeanne Giles of Battle Born Knits went out with a bang! 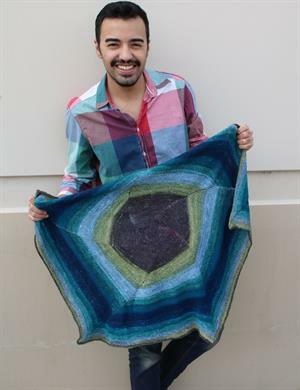 Featuring slipped stitches on the diagonal using yarns and colors that'll surely have you pining for full skeins, this bag was stuffed with generous balls of Berroco Ultra Alpaca Fine (for continuity, of course), soft Isager Alpaca 2, and color-ific Malabrigo Sock to finish your shawl. 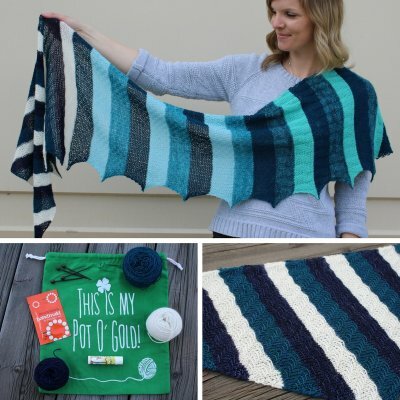 Along with 4 seaming pins and a surprise Bar-Maids Lo-Lo sample to pamper yourself after a job well done, this really was the perfect finale for a super fun project! For those who aren't subscribed to our Big Beanie Bag program, all three parts to this wonderful project can be purchased as an all-in-one kit here!